Squirrels are perhaps the most visible of the many rodents that can affect your home. 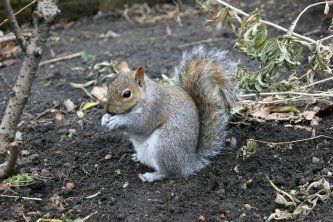 These bushy-tailed creatures may seem cute to some people, but they can inflict real damage if they get into your attic. Because of the Bay Area’s mild climate, rodent-proofing is necessary year-round to keep squirrels from nesting inside your home. Read on to learn how professional rodent control experts in San Jose will help ensure that squirrels can’t find a way into your attic. Squirrels are extremely agile climbers, very adept at running up trees and along narrow branches. They are also excellent jumpers, so any tree branch that is close to your roof will allow them access. The first preventative measure you can take is to trim your trees so that the branches are more than six feet from the edge of the roof. Another thing you can do is install a wide metal band around the trunk of the tree about six or eight feet above the ground. This will prevent squirrels from scurrying up the tree. Tree trimming may not be an option for you, especially if the branches extending close to your roof belong to trees planted on a neighbor’s property. Also, squirrels can still sometimes get to the roof by scurrying up drainpipes or even using power lines. To keep the rodents from finding their way into your attic, rodent control professionals will make sure that there are no holes in the siding or roofing that allow them in. The holes that allow squirrels entry can be very small, and it often takes a professional eye to spot them. Rodent repellants are widely available at home improvement stores. Be careful of these products, however; when incorrectly applied, they can be dangerous to your family and your pets. Professionals know how and where to apply rodent repellants (including squirrel repellants) safely so that they don’t pose a threat to your health. When safely used, repellants can keep squirrels from invading your home, and even drive out any that might have already done so.